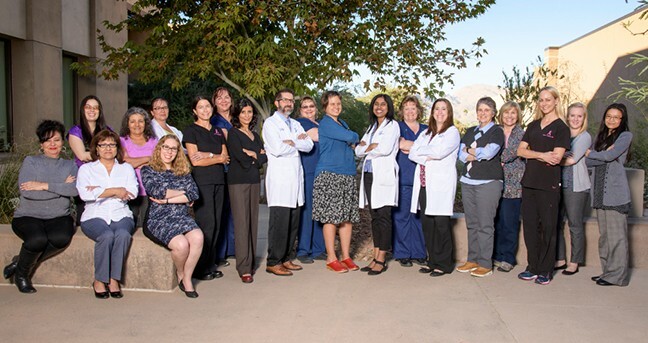 The University of Arizona Cancer Center's multidisciplinary breast team is committed to supporting patients through all stages of cancer. The University of Arizona Cancer Center and Banner – University Medicine will educate the community about breast cancer risk in an outreach event on Saturday, Sept. 29, from 9 a.m. to noon in Building 2 at the UA Cancer Center – North Campus, 3838 N. Campbell Ave. The event is open to the public. The presentation, titled “Are You at High Risk for Breast Cancer?” will cover a range of topics, including genetics, preventive surgery, risk reduction and clinical trials. Personal risk counseling will be offered to all attendees who wish to participate. Visitors need no appointment to receive this assessment. While people can make the decision to drink less and exercise more, some risk factors are immutable. Cassie Garcia, M.S., C.G.C., a certified oncology genetic counselor, will give a presentation on how genetic testing and a detailed understanding of one’s personal and family history can help patients make decisions about genetic testing options, screening and prevention. Attendees will be able to meet with a breast team nurse to assess their personal risk factors for breast cancer. Basic education about risk-reducing lifestyle changes and the importance of screening mammograms will be provided. Those who wish to take it a step further and meet with a genetic counselor at a later date will be offered that opportunity as well. Those with genetic mutations or a family history that put them at an especially high risk for breast cancer might choose to reduce their risk by having their breasts prophylactically removed. UA breast surgeon Rebecca Viscusi, M.D., will give a presentation on surgical options for high-risk patients. High-risk patients might also have questions about how often they need to receive mammograms to screen for breast cancer. Suzette Bryan, M.D., breast radiologist and assistant professor at the UA College of Medicine – Tucson, will review current recommendations for patients at increased risk for breast cancer. Sima Ehsani, M.D., UA Cancer Center breast oncologist and assistant professor at the UA College of Medicine – Tucson, will give a presentation on risk-reduction strategies, including chemoprevention options like tamoxifen. Her talk will be aimed at people she calls “previvors,” those who are at higher risk for developing breast cancer, but who have not been diagnosed with the disease. Attendees also can learn how they can participate in research to help expand scientific knowledge about breast cancer risk. The UA Cancer Center is recruiting patients for several clinical trials to investigate better ways to prevent breast cancer in high-risk patients. Attendees are encouraged to RSVP by calling 520-626-0191 or emailing Annette Price at Aprice@uacc.arizona.edu. For more information about the UA Cancer Center Breast Cancer Multidisciplinary Clinic, please visit the UA Cancer Center website. To make an appointment at the UA Cancer Center — North Campus, call 520-694-CURE (2873). To make an appointment at the UA Cancer Center — Orange Grove campus, call 520-742-4183. To make an appointment with the UA Cancer Center Breast Imaging Center, call 520-874-MAMM (6266) or 874-6300.